We created the original River Road Recipes cookbook. Share in the secrets of fine Creole and Cajun cooking with the Junior League of Baton Rouge’s award winning cookbook series, River Road Recipes. Since 1959, our award-winning cookbooks have captured the essence of Louisiana cooking and have delighted chefs and guests alike with their delicious recipes. With over 1.9 million books in print, River Road recipes speaks for itself. After all, it is the all-time #1 best selling community cookbook series in the nation. River Road Recipes II, A Second Helping, builds on the success of River Road Recipes I by offering 606 triple tested recipes. River Road Recipes III, A Healthy Collection, brings Louisiana cooking into the eating-better, health conscious age by providing reduced fat versions of old recipe favorites. It delights with 341 lower fat and calorie recipes while still retaining the great flavor Cajun cooking is known for. All recipes include a complete nutritional analysis. River Road Recipes IV, Warm Welcomes, our newest addition, illustrates how we cook, eat and live in Baton Rouge. It features 48 menus, with over 300 innovative recipes, and color photographs to assist with all of your entertaining needs. A USA Book News “Best Books 2005” Award Finalist, Cookbook Category. 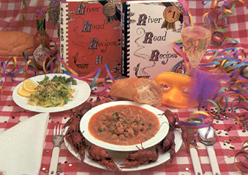 River Road Recipes I, II and III are all included in the Walter S. McIlhenny Community Cookbook Hall of Fame. The real winner, however, is the Baton Rouge community, which has benefited from more than $3 million derived from cookbook sales and donated by the Junior League of Baton Rouge to local charitable and educational projects. Visit the blog for some of our beloved recipes, current event updates, and much more. Come hungry and visit often!